diving in crystal clear waters, fishing and more! Day 1--Our flight leaves from the Salt Lake City airport and will be arriving in Belize City in the afternoon. We will be met by our air conditioned charter bus which will transport us to the our hotel in San Ignacio. Overnight San Ignacio. 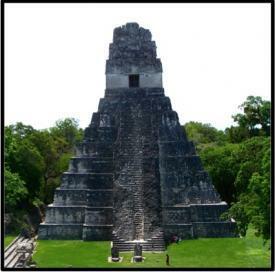 Day 3-- Get ready for an adventure of a lifetime as we cross the border into Guatemala to visit Tikal, one of the most important cities in Maya history. A place you will never forget. Overnight in San Ignacio. Day 4-- Today will be a free day for you to choose from several activities near San Ignacio. Some choices are the ruins of Caracol, the ATM Caves, (See You Tube vid) or nearby waterfalls. We will have information about options to help you make your decision for a great day in the jungle! Day 5--We have an exciting day planned with stops at the Jaguar Paw Resort foroptional excursions of cave tubing and/ or canopy tour. Overnight at the Black Orchid Resort. Day 6-- We will head North toward the town of Orange Walk. Here, we will board boats to take us on a trip up the New River, to the ruins of Lamanai. This is a spectacular site, deep in the jungle of Belize, situated right on the banks of the New River. Lunch is included today. After our trip to the ruins, we will head back to the Black Orchid Resort. Day 7--Today we will check out of our hotel and head toward the Caribbean coast for a water taxi ride to Caye Caulker, a beautiful little island 45 min of the coast of Belize City. We will first have a short drive to visit the ruins of Altun Ha before heading to the water taxi. After arriving to Caye Caulker, we will check into our hotel where you can relax or take a stroll around the sandy roads of the quaint little Caribbean island. Overnight in Caye Caulker. Day 10-- Our flight leaves late in the afternoon so you will have your morning to relax and enjoy the tropical beauty of the island before heading back into the winter wonderland we call home. We will check out of our hotel around noon and catch the water taxi back to Belize City and on to the airport for our flight.